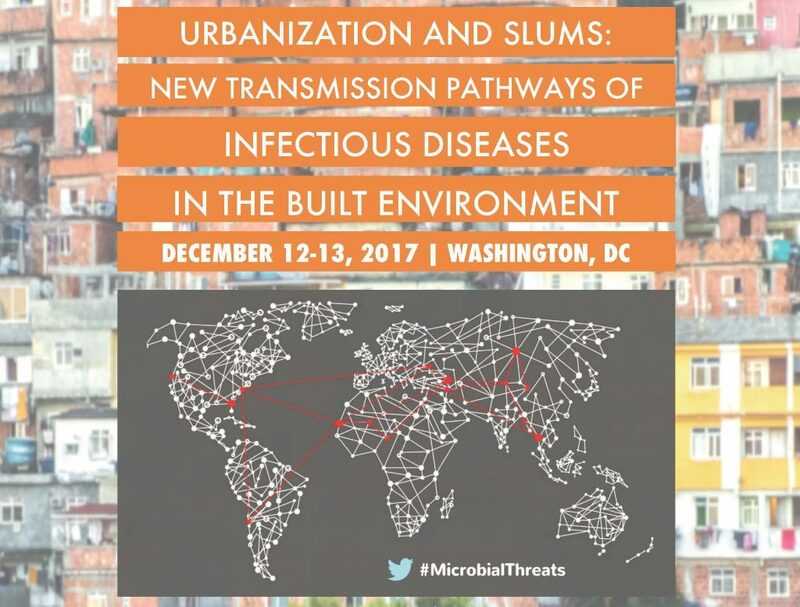 On December 12-13, the National Academies’ Forum on Microbial Threats, in collaboration with the Board on Life Sciences, will host a 1.5-day workshop examining “Urbanization and Slums: New Transmission Pathways of Infectious Diseases in the Built Environment.” This workshop was developed with input from the experts and staff that produced the National Academy of Sciences Microbiomes of the Built Environment: A Research Agenda for Indoor Microbiology, Human Health, and Buildings study report and symposium featured on this site. Strategies to close the research gap and scale up successful practices. Invited speakers and discussants will contribute perspectives from government, academia, private, and nonprofit sectors at the global, national, and local levels. PLEASE NOTE: This workshop is a forum meeting that members of the public are welcome to attend, but space is limited and registration is required. Register now to attend in person or see the webcast! The event will be livestreamed during the times below at our page here. Whether you are joining us in person or via webcast, tweet using #MicrobialThreats to add to the conversation. Visit our workshop page to learn more and check out our agenda!